There are over 500 different species of Oxalis that are commonly known as Sorrels or Shamrocks. Many of them have become weeds after being imported into other regions. to the garden as ground covers or as rock garden plants. 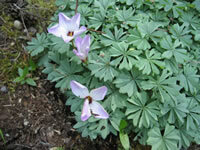 Shamrocks may grow from bulbs, corms or rhizomes. The hardiness varies with different species, from hardy in zone 3 to frost tender. Tender species can be grown in containers and brought indoors to overwinter. 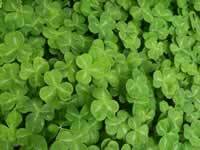 Shamrocks grow and bloom best in full sun, but will they will tolerate partial shade. In hot summer regions they will need protection from the afternoon sun. They should only be planted in very well drained soil. but Shamrocks prefer to be kept on the dry side during winter while they are dormant. In areas with wet winters they should be grown in raised planting beds or under the eaves of the house. Many hybrid Shamrocks are grown and sold as house plants in early spring. They are very easy to care for plants, but they do have a few cultural requirements. relatively cool temperatures and plenty of fresh air. but allow them to slowly dry out and go into dormancy when they begin to lose vigor. Like all bulb type plants, Shamrocks require a period of dormancy every once in a while. 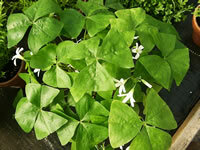 Shamrock Plants grown in containers will need two or three rest periods every year to continue growing their best. stop watering and as the leaves all turn brown, pull them off. cool and dry for about two or three months. Note: The purple leaved varieties of Shamrocks only need about a month of rest. and give them a shot of all purpose house plant food (10-10-10). In a very short time you will be rewarded with a happy new Shamrock! At the end of the dormant cycle you might want to remove the Shamrock bulbs or tubers from the pot. Separate the bulbs and replant just under the surface of the soil in good, slightly sandy houseplant soil.